Made by Byron Surf Shop in Byron Bay, New South Wales, Australia, 2003. The artist first started surfing 31years ago, 1972 age 18. Not many Aboriginal people were widely known to surf nor is there any documentation linking Aboriginal and surf culture around that time. This artwork is only one of two that he has done to date. With this particular work he wanted to produce something that was representative of surf culture, the use of bright, vibrant colours which we see as representational of beach and surf products. Malibu long board surfboard with top side painted with 'Sun Sand and Sea' indigenous artwork by Wakka Wakka (South East Queensland) artist Kevin Williams. The top side of the board has a pale yellow background with the artwork located centrally. The painting is based upon a blue wash and has been executed using brown, green orange and blue dots. There are numerous makers marks on the board top and underside each consists of "[logo] / Byron Surf. Artist signed and dated on top side in pencil under glaze "K Williams 2003". 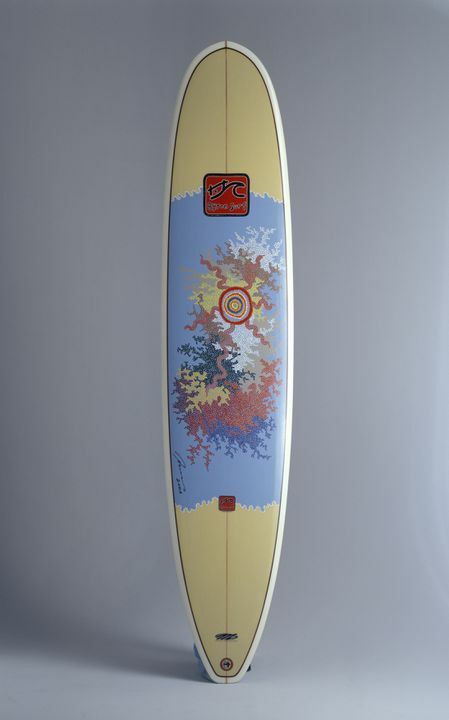 The artwork featured on the surfboard is titled 'Sun Sand and Sea'. Kevin acquired the surfboard from the owner of Byron Surf shop in Byron Bay New South Wales, who cut the foam board, he then put a fibreglass glaze onto the board, Kevin then painted the board and then another fibreglass layer was added over the artwork. The board was then polished. The surfboard has never been ridden in the surf, it was produced specifically as an artwork and is not viewed by Kevin as being functional.